« What is it like to have RA? Second – my mobility service dog, Emmy. She does so many things I have to refer you to some of the short vids I’ve taken of her to see just a FEW of the things she does for me!! These represent less than 25% of what she does for me! About having a service dog – she helps me stay flexible and supple because I have to do all her feeding and grooming on a daily basis – no matter how badly I hurt or feel. Himself can’t do it for me, but can help me. A service dog must have her teeth brushed and mouth wiped out, ears cleaned, fur wiped down with a moist cloth [I use pre-moistened doggie wipes] and be brushed – every day!! Emmy goes to the groomer 4 times a year, too. For more info, check out Emmy’s blog: Living With the Woof. Third – electric recliner that I don’t have to use my whole body to raise and lower [like I did the other one]. I also have another, non-electric recliner that is super cushie. Really helps on those days that are so achie I can’t stand to sit in a firmer chair. Fourth – there is, of course, the Black and Decker electric jar opener. When I have to cook [when Himself isn’t feeling well] I can just stick a jar of pasta sauce in it and turn it on. It opens it for me. AND, it lets me use both hands to handle the jar. I also have a collection of other opener types. Fifth – my shower chair. You ladies brace yourselves – I sit on it in the bathtub, and if I need help, Himself bathes me, gently, all the places I can’t reach or deal with depending on which joints are flared. He’s even learned to wash my hair without spraying water in my eyes and ears! If I don’t need help, then I just sit and shower – less tiring and easier for me than standing. As we’ve been married almost 36 years, now, I strongly doubt there is anything between us that should raise issues of modesty! Remote Mouse – Lives on the arm of my chair. Sixth – the computer set-up Himself fixed up for me! I have a desktop on the floor by my chair, a remote keyboard, a remote mouse, and a monitor that is on an extension from the wall. The heaviest component I have to handle is the keyboard which only weighs 1 lb 5 oz (or 594 gms). Even on a really bad day, I can slide it onto my lap or slide it back onto the little table without having to pick it up. Monitor, adjustable from the wall, with clips holding pages I’m working with and notes. Seventh – I really like having the Acorn Stair-lift that Himself and my oldest son installed for me when we bought this house. It makes access to the car, basement, pantry, and workshop possible for me! I would have worn out my hips and knees much sooner if I had to go down and up the stairs on foot 1-5 times a day! And, of course, there will be more and more days I will not be able to go downstairs and back at all. Biofreeze – good for up to moderate aches and pains! Eighth – Biofreeze! What would any of us do without it! Roll or rub it on aching joints and/or aching muscles for relief. I don’t consider it either medical or medicinal because it is available without Rx pretty cheaply from Amazon.com. Lily von Schnort and Christie Fur Columbus Such sweeties! Great for sharing body warmth! Ninth – this list wouldn’t be complete without mentioning “Lily von Schnort” and “Christie Fur Columbus” – our little Bombay cats [5 yrs old, and 5# weight each]. At night, they curl up on either side of me right against my hips and “share warmth.” This helps keep my hips from hurting so much. They curl up on my lap during the day and help me relax with their purrs. Tenth – finally, I absolutely can’t live without my Hitachi body-wand. This device was originally made for physical therapy professionals. Now it’s available on the internet for anyone to purchase – from a variety of websites. I have fibromyalgia, which many RA’ers have, and Himself uses it on the muscles that hurt. My joints it doesn’t work as well for, but “buzzing” around the edges of the hurtie joints stimulates circulation and helps my pain to reduce immensely. This is not in any way a complete list, but I wanted to show how we try to think “outside the box” for my comfort as well as using the “usual” kinds of things. For instance, Dragon Naturally Speaking is going to become my friend as soon as I can remove about 1/2 of the software from my computer! Right now it “locks up” everything. and my Hibermate sleep mask. And the list goes on… ♪ ♬ ♪ ♬ …and the list goes on! Well written and I commend your husband for being such a great guy. Im a 62 year old male and have had RA for about 35 years.It has altered my life completely. I am still mobile because of methotrexate and if not for that med would be wheelchair ridden. It is a cruel disease and very hard for the average person to comprehend what a person with has to go through every day having it. Im glad I came across your article because it has rejuvinated me and lifted me out of my depression somewhat. It lets me know that I am not alone in this battle and that other people have it too. Thanks and keep up the fight. Case, you absolutely are NOT alone! There are 2MILLION+ of us in the USA alone! Be sure to subscribe to rawarrior.com. Kelly keeps us up on the newest drugs and treatments, also the newest diagnostics. She is AMAZING! I don’t post very often – I’m currently trying to write a murder mystery, and it has taken me away from my blogging. 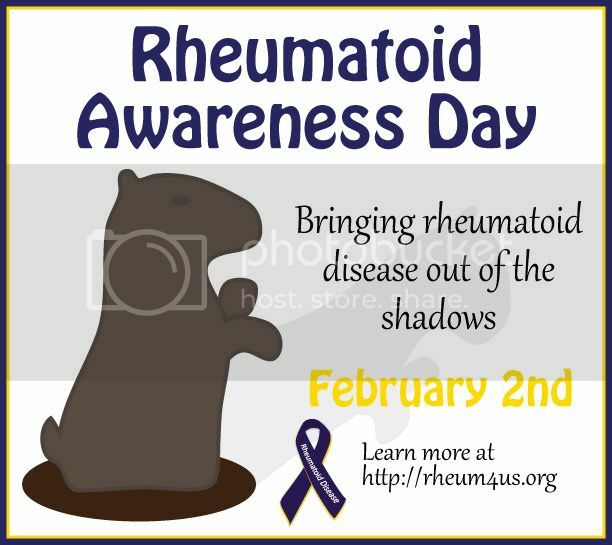 There are numerous blogs about RA. I’ll have to write a post listing my 10 favorite RA blogs! What a great list. A friend suggested I consider getting a service dog to help me with my photography – to walk around with me, support me, and help me if I fall. I’ve been thinking about getting a shower chair. Most days I do OK in the shower, but there are times that I don’t think I can stand another second. What a great list of helpers – they really sound like major assistants. More of your RA Aids are alive than mine. I really can see the value of pets and service dogs after being in an online group for many years but we don’t have any pets now. It’s great that your cats are heat seekers/providers. .
It’s nice to hear that their are loved ones who will stick by you no matter what. I too have a wonderful husband who I don’t know what I would do without. He always tries to make life easier for me. I feel real guilty sometimes and feel like a burden to him. I don’t want to do certain things like go to a Dodger game because I get tired to walk he just tells me we will get w wheel chair. He will not go without me. These men are amazing. I’m glad to hear that I’m not the only one whose lucky. I pray that everyone with this disease has a person in their lives who cares because we can’t do this alone. Praying for everyone with this disease that someone finds a cure for us. Mrs. Apple, I agree! We all need family members to love and support us – just as we would love and support them! God bless your husband! Mine “encourages” me to accompany him everywhere. We are “joined at the hip,” and Emmy is “joined to my other hip,” as we say! I need them both, and they both give their all for me. I thank God for them every day! I love your top ten, I almost wrote about 2 of the same, your # 1 item is such a blessing, luckily I have a husband that loving cares for me also, I couldn’t live without him. I also use a shower chair in the tub, I usually plug the drain and let my feet and ankles soak I’m the hot water while I’m washing my hair ect. It seems we have a lot.on common, can’t wait to get to know you better.